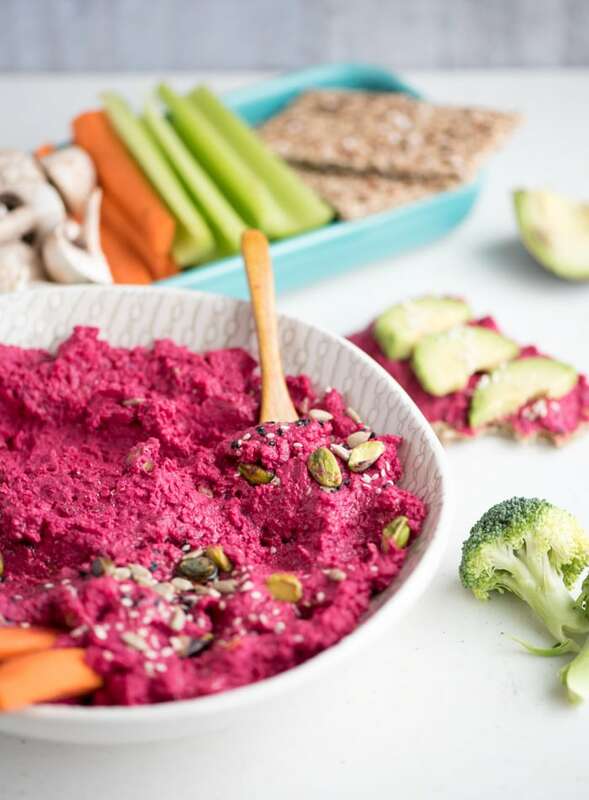 This healthy beet hummus is oil-free, flavourful and high in fibre, antioxidants, vitamins and minerals. 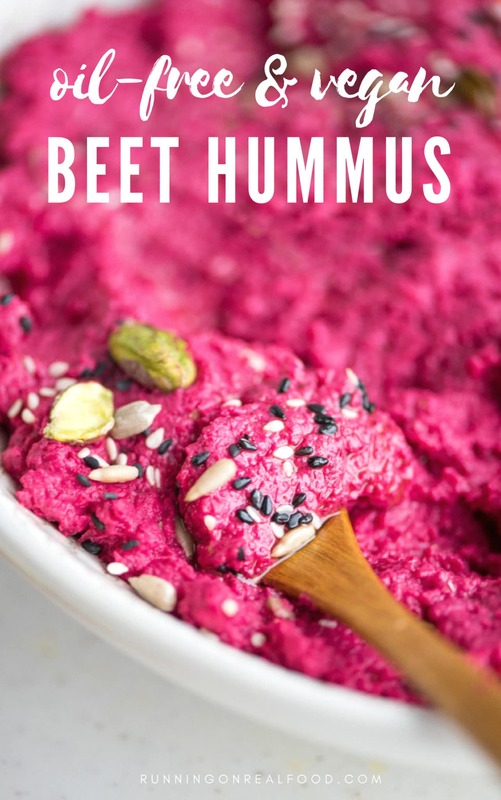 It’s made with steamed beets, chickpeas, garlic, lemon, tahini, sea salt and aquafaba (chickpea water) for a delicious, creamy and low fat spread that’s awesome in sandwiches and wraps, on salads or as a dip for raw veggies, chips and crackers. Beets definitely deserve a spot in your weekly veggie rotation. They’re inexpensive, versatile, delicious and offer a ton of heatlh benefits. Yes, they might be a litlte messy to deal with at times but the result is well worth the effort. Plus, that colour! 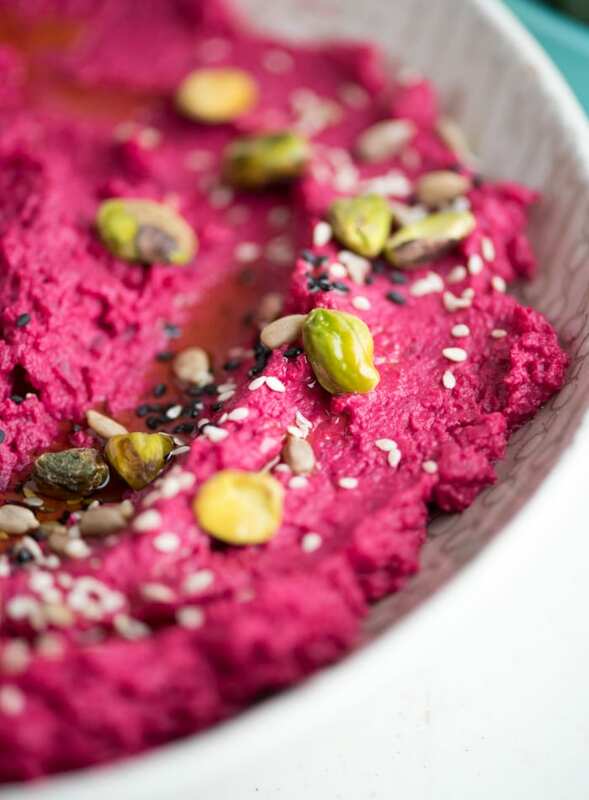 You can’t beat the beautiful pink colour that beets give to this hummus. No need to worry about some obscure ingredients you’ll need for this recipe. Aquafaba is simply the liquid you’d drain out of a can of chickpeas, or chickpea cooking liquid if you cook your own. I used a bit of chickpea liquid instead of olive oil in order to keep this recipe low in fat and oil-free. 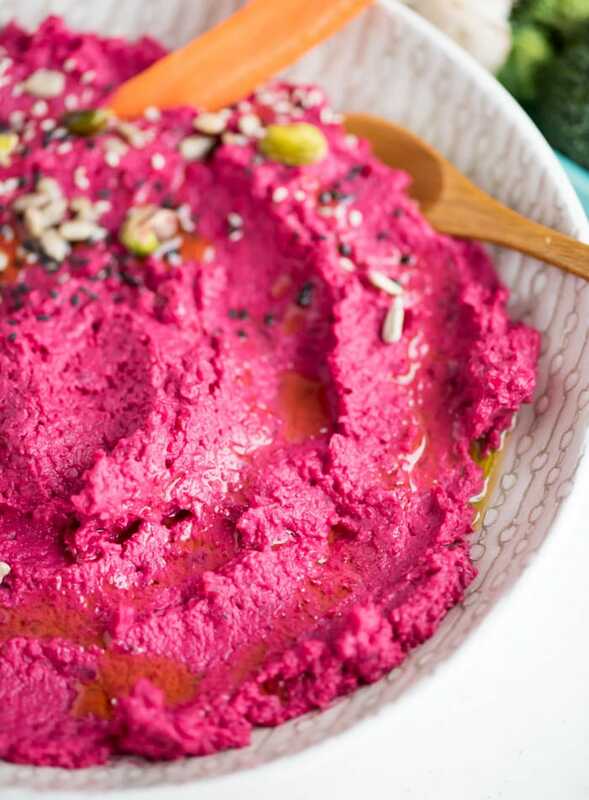 Once the beets are cooked, the hummus is a breeze to make in minutes in your food processor or high-speed blender. 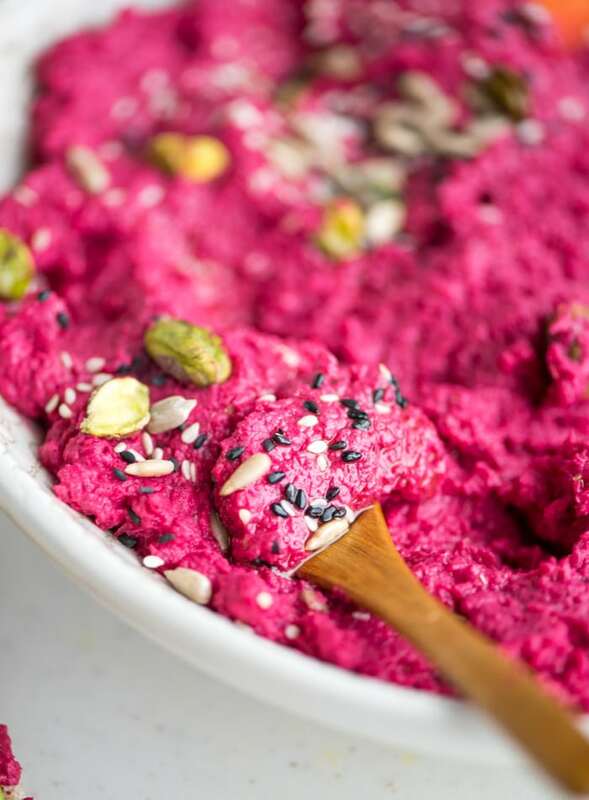 In addition to the beets, you’ll need a can of chickpeas or about 2 cups of cooked chickpeas, a little of the chickpea liquid, tahini, sea salt, lemon and garlic. The tahini, garlic, chickpeas and lemon are key ingredients. You can use olive oil instead of aquafaba if you prefer but I wanted to keep mine oil-free. The chickpea liquid gave it the creaminess I was looking for without the need for oil. I peeled my beets first, then chopped them and steamed them on the stovetop but you can also roast them in the oven. Steaming is faster but I do prefer the flavour and colour of roasted beets so if you have the time, go for roasting them wrapped in tin foil. 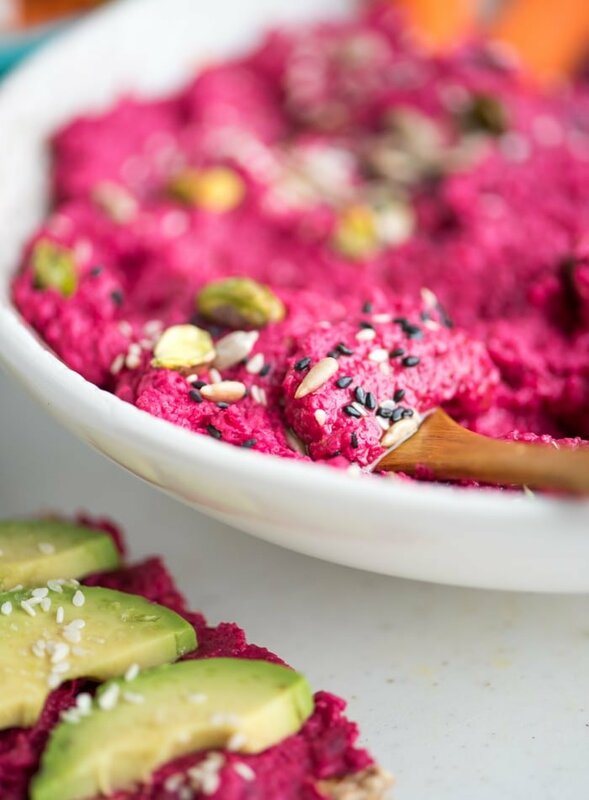 Beet hummus is so bright and beautiful, it’s perfect to take to parties or serve as part of a holiday spread. It looks beautiful on a platter surrounded by veggies, sliced baguette and crackers. 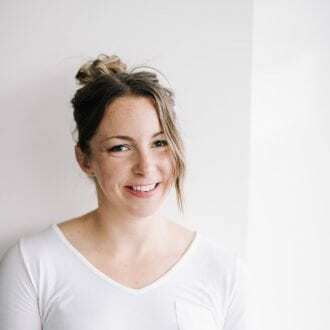 It’s also a delicious side to any meal as a way to sneak more raw veggies into your diet and you can’t really taste the beets so it’s a good way to enjoy the health benefits of this nutritious veggie if you’re not a big fan. Try it with raw broccoli, bell peppers, carrots and mushrooms to load up on nutrition. 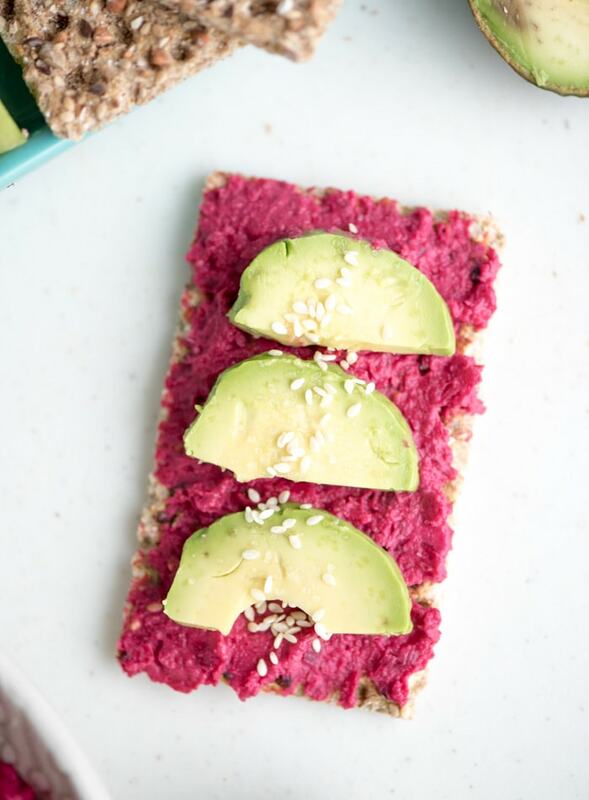 This oil-free healthy beet hummus is amazing in sandwiches and wraps, spread on crackers topped with avocado and a bright and beautiful dip for raw veggies. Cook beets to your preference. I steamed mine but you can also roast them in the oven (see notes). They should be easily pierced with a fork when done. Place the cooked beets in a food processor or high-speed blender and pulse a few times to break down. Add the rest of the ingredients and process until smooth and creamy. Serve right away or store in the fridge for up to 5 days. To roast beets, preheat oven to 400 degrees, wrap scrubbed beets in tin foil, place on a baking sheet and roast in the oven until easily pierced with a fork, approximately 45-60 minutes. Once they’re cool, rub off the peel and slice for use in the recipe. To steam beets, place a steamer basket over a saucepan and add peeled, chopped beets. Cover and steam until the beets are easily pierced with a fork, about 15-20 minutes. You can keep the skin on for steaming if you prefer, it will easily rub off once they’re cool. This recipe makes about 15 servings of 2 heaping tablespoons, or 40 grams. I usually eat about 60 grams at a time though, which is about 1/4 cup and 88 calories, 11 g carbs, 3.4 grams fat and 4.2 grams protein. I never entertained the thought of Avocado with Hummus, or Avocado with Beets. While most people wouldn’t entertain that combination, I must say that Avocado and Beets is a good and healthy combination of Testosterone and nitric oxide. I was looking for Beet specific recipes. I didn’t grow up with beets, so it’s pretty new for me but I have read so many things recently on how healthy they are. So now I am trying to educate myself on all things beets and saving up some recipes to try out this month. I pinned this for later!